The MEDIA section provides downloadable information you need to share, learn about, and display RIDGLOK® branding in your materials, website or PR materials. Brochures Use these downloadable brochures to educate your clients about vertical standing seam tank insulation in THEIR industry. LOGO Standards & Style Guide RIDGLOK® logo files and design guide standards so you can include the RIDGLOK® logo in your branding brochures and materials. We publish regularly and often on LINKEDIN. Visit the following links to either the RIDGLOK® LinkedIN page or Rebecca Maye’s LinkedIN page to find lots of great news an information. Connect with us on LinkedIN to stay current on the latest news in our industry and to see what we’re up to. We want to build awareness in the Tank business for vertical standing seam insulation. One of the ways we do that is to publish informative articles in industry magazines. Visit these links to read a couple of our latest articles. 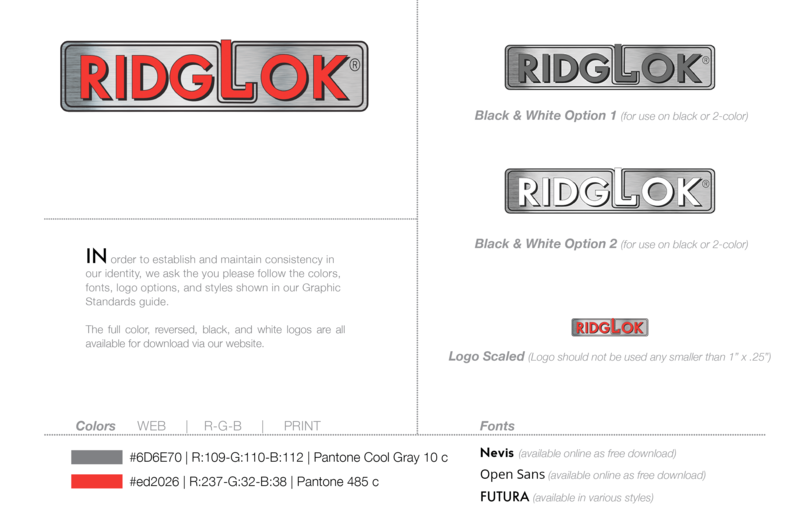 All use of the RIDGLOK® registered trademark logo must conform to the standards listed below. There can be no changes in color or proportions with use of the logo in any format. If you have any questions please contact the RIDGLOK® Marketing Department. If you need additional files or information, CALL US at (855) RIDGLOK (743-4565). If you prefer online contact, use our SHORT FORM or LONG FORM on the contact page. You can use either to upload documents you’d like to share. And don’t worry. We won’t put your email on our newsletter list – you have to sign up for that intentionally.